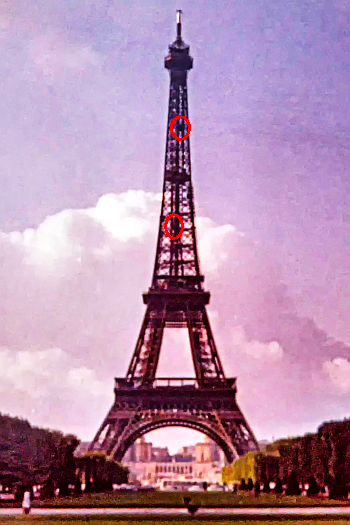 Gustave Eiffel’s new tower, to be built in Paris for the anniversary of French Independence in 1889, wasnt just something that could be put up at a whim. No-one had to that date ever built so high, and worse no-one had ever built lifts that could climb such heights. 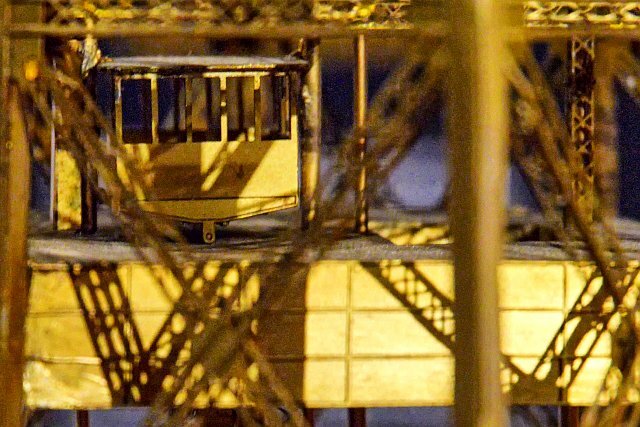 Originally Eiffel had held the notion stairs would be sufficient but eventually he was convinced, in part by the authorities, his La Tour Eiffel would not be complete without lifts. Ultimately the Eiffel Tower holds the record for the world’s longest surviving lifts of that type to scale such heights. These were the Edoux lifts, nowadays a wholly forgotten part of the tower’s history. The Tower posed two problems. First that required lifts must change direction en route to the second floor. The other was that any lifts to the summit floor had to climb a massive height. Postcard from my 1973 visit depicting the three main lift systems. The Edoux’s lower cabin is shown on the right. Eiffel decided to tender out contracts for the lifts to companies who deemed they could overcome the technological challenges. USA’s Otis and France’s Roux-Combaluzier-Lepape took up the challenge for the first stage and installed lifts, two pillars to each company. Both overcame the problems where the first part of travel was at 54.5 before changing to 79, a difference of over 23 degrees (figures approximate) between the ground and second floors. For the stage of travel to the tower’s summit, Eiffel first considered a guy named M Backmann (of whom little is known) before enlisting the help of Félix Léon Edoux. Both had been friends since the Ecole Centrale Paris. Edoux was known for having built the tallest lifts in the world to date with a climb of approximately 230 feet (70m) at the Trocadero in Paris. 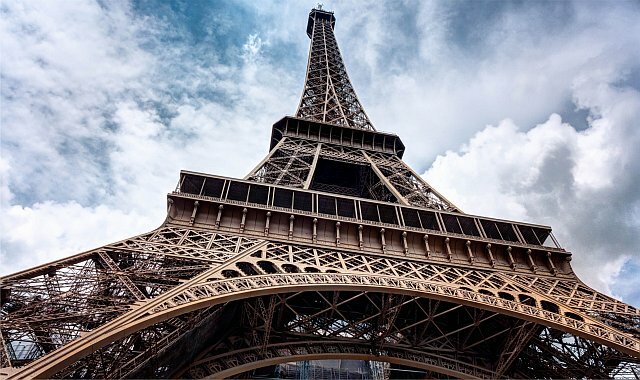 Despite this height it was nearly at the maximum of his system, yet Eiffel’s design required a climb of 525 feet (160m) roughly the entire height of Blackpool Tower! It seems not even Edoux had the expertise to achieve such heights, so a compromise was made. Instead of a direct lift, Edoux’s would operate in two sections, each 262 feet (79m), and meet at a point halfway, roughly 668 feet (203m) above the ground. Well that’s nothing these days in terms of how high our buildings or these high altitude glass bridges are, but when the lifts were in operation that was scary! The lifts were a hybrid hydraulic/cable operation. Basically the upper flight cabin was operated by hydraulics whilst the lower flight cabin was operated by cables linked to the upper cabin. Two of these cables tethered to the top of the upper cabin whilst two others extended past this cabin to be tethered to the top end of the hydraulic rams. 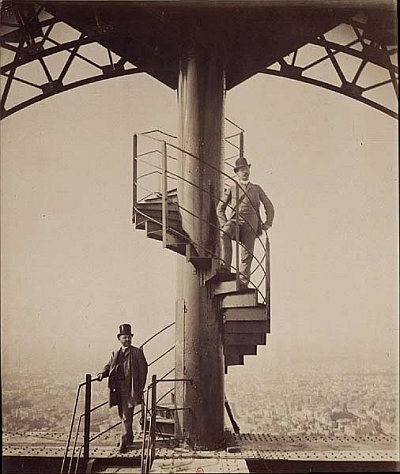 This picture of Gustave Eiffel at the summit of his tower belies the fact the photographer stands upon one of two gigantic cross beams, that which houses the Edoux cable return mechanism. The photographer would have been right over the pit which drops the cables down to the lower cabin. Picture from Wikipedia. The hydraulic rams extended the length of the lower section meaning when it was fully extended it reached the tower’s summit floor. Hence each cabin operated in unison, rather like a funicular, but not quite, perhaps it was more along the lines of what one would see on the Stetchelberg-Gimmelwald-Murren section of the Schilthorn cablecar, which too uses an ingenious system of pulleys and counterbalances where the cars meet at Gimmelwald, the passenger transfer point. Earlier I mentioned Backmann, who was a lift engineer from Paris. 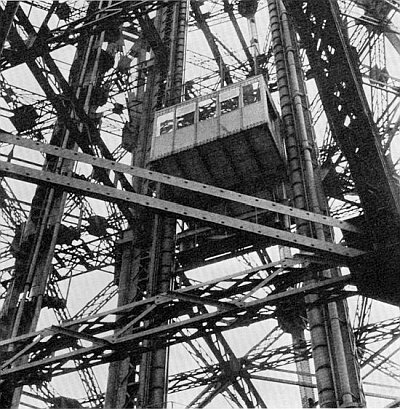 Eiffel declined the use of his elevator system, but conversely Edoux employed Backmann’s own unique helicoidal braking mechanism. Its a screw-operated system running up and down a threaded rail, which means the brakes are practically on. They’re not, but the slightest drop will activate the system. In other words under normal speeds the brakes would just rotate, if the speed got any faster, they locked, and were attached to the lower flight cabin. If this ran faster for any reason (eg cable failure) it would then immediately stop. This, along with the hydraulics, meant the Edoux lifts were extremely safe. No wonder they lasted such a long time. Despite the tower opening on 31st March 1889, it was steps only to the top, all 1,710 of them! All the tower’s lifts had to be completed by 1 April 1889, and be available for a month’s testing. 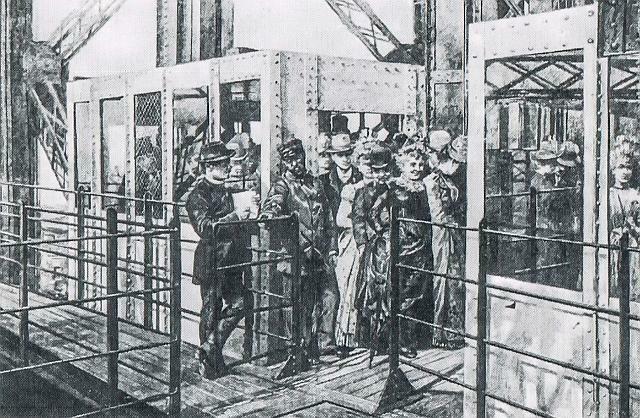 The Edoux lifts were no exception and had to take part in the rigorous testing regimes that followed in order that the tower’s lifts be running from the 6 May 1889. Clearly the testing period was extended well past that date as on the 29 May one of the Otis lifts was subject to a free-fall test to prove its the brakes worked as they should. 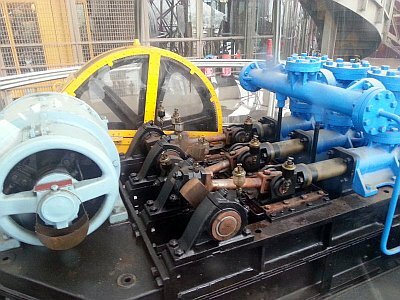 The pumps for the lift’s hydraulics was located in the tower’s south pier (pilier sud) and these pumped water up to the header tanks located within the top of the tower and necessary to work the huge hydraulic rams. The lower Edoux cabin (pictured) was in the north section of the tower, whilst the upper was at the south. By the mid 1970s complaints were regular about the tower’s lifts. Those within the lower stage were extremely noisy and gave a quite rough ride, whilst the Edoux lifts, smooth as they were, were just too slow for modern day needs. At least 25,000 visitors a day to the tower, which meant less than a fifth of that daily total could go to the top. It wasnt just the rise but the fact passengers had to change halfway in what was to all purposes and intents in mid-air. There were just railings no higher than one’s waist, protecting from the gloriously dizzying height that those with a nervous deposition had to walk across, there was just nowhere else to go! The change-over point is seen as a boxed area (the ghost intermediate floor) in contemporary views of the tower, yet in reality, the actual location was a big hole through the middle of this boxed area and to all purposes suspended in mid-air  very little below and nothing above so to say. Pictures of the transfer point are few and far between, however here’s one from an old book on the Eiffel Tower in my collection. The Edoux lifts at the interchange point soon after the tower’s inauguration May 1889. One other problem with the Edoux lifts was the hydraulics froze in winter, which meant the top of the tower had to be closed too. Anti freeze would have been no good because far too much would have been need for normal operation. It seems anti freeze was used to prevent the system freezing overnight but that was not always successful. An article in the Irish Times for 8 January 1979 tells us plans for the tower to stay open all night throughout the new year of 1978/79 had to be curtailed when extreme temperatures froze the lifts. A few months earlier a reporter wryly said ‘the Edoux system, going on ninety, is getting crotchety…’ They had been working for eighty-four years! I am sure the age of the Edoux lifts, along with the aforementioned new year’s debacle, prompted the tower’s authorities to consider replacement lifts. The Edoux were replaced by a bank of Otis elevators (the Duolifts.) Though far smaller they’re much faster and pretty well triple the capacity offered by the Edoux lifts. These Duolifts have already been replaced once and refurbished several times. The Tower and Edoux in miniature. 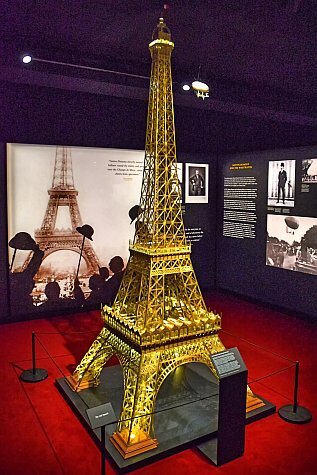 RJ Models built a 1:110 scale model of the Eiffel Tower for the Cartier exhibition currently on at the Design Museum in Kensington. 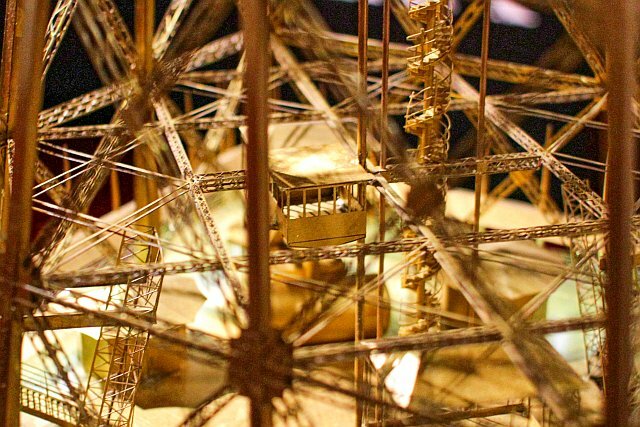 Its a fascinating model and the eye for detail has largely been maintained, the tower is just as it was in its first years! The upper flight cabin correctly depicted by RJ Models. Of course things cant be 100% at a scale like this, however I did notice that RJ models had got the Edoux lifts wrong. First, the Edoux lifts are shown as two independently operating lifts! Secondly, both cabins are exactly the same design, implying both are hydraulically driven. In reality the lower cabin is of a different design because it the one operated by cables. The lower flight cabin is a copy of the upper one, which is wrong. Next Post: A Wonderful Sign!